Gun Runner’s name conjures up images of derring-do, hijinks, and dangerous skirting of the law. But this 2016 Kentucky Derby (G1) contender is no renegade from the wrong side of the tracks. On the contrary, he’s a regally bred colt who’s living up to high hopes. Just how fashionable is his pedigree? His dam, Quiet Giant, was sold for $3 million at Keeneland in November 2011, a couple of months after her signature victory in the Molly Pitcher (G2) at Monmouth Park. That purchase price reflected her supreme potential as a broodmare, not only as a major stakes winner by renowned international sire Giant’s Causeway, but principally on account of her female line. Quiet Giant is a half-sister to 2005 Horse of the Year Saint Liam, and her further family has been producing high-class performers on both sides of the Atlantic for generations. She descends from the noted matron *Flambette, bred in France by the great owner/breeder William Woodward and imported upon the conclusion of World War I. Flambette is the ancestress of 1935 Triple Crown winner Omaha, 1939 Kentucky Derby/Belmont romper Johnstown, and their colleague in the Hall of Fame, the outstanding racemare Gallorette. In recent decades, this bloodline has been cultivated successfully by another statesman of the turf, Edward P. “Ned” Evans. Gallorette’s granddaughter, Flight Dancer, proved an inspired acquisition. For Evans, she foaled Misty Gallore and Irish champion Minstrella, and ultimately carved out an enduring legacy over a couple of intervening generations to Saint Liam and Quiet Giant. Sadly, Evans passed away December 31, 2010, only 19 days following Quiet Giant’s first stakes victory at Aqueduct. She was campaigned by his Estate for the remainder of her racing career, and offered at Keeneland as part of the complete dispersal of Evans’ bloodstock. The Evans Dispersal was the talk of the bloodstock world. Benjamin Leon’s Besilu Stables set out to secure some of the most coveted horses in the dispersal – hence going to $3 million for Quiet Giant. But Quiet Giant didn’t leave the Evans orbit entirely. For Chris Baker, who had served as manager of Evans’ Spring Hill Farm in Virginia, subsequently took on the role of general manager of WinStar Farm near Versailles, Kentucky – Quiet Giant’s new home. Baker was also involved in selecting the stallion who would introduce Quiet Giant to her new career as a broodmare. The chosen suitor was undefeated Argentinean champion Candy Ride. The happy result was Gun Runner, who was born and raised at WinStar. 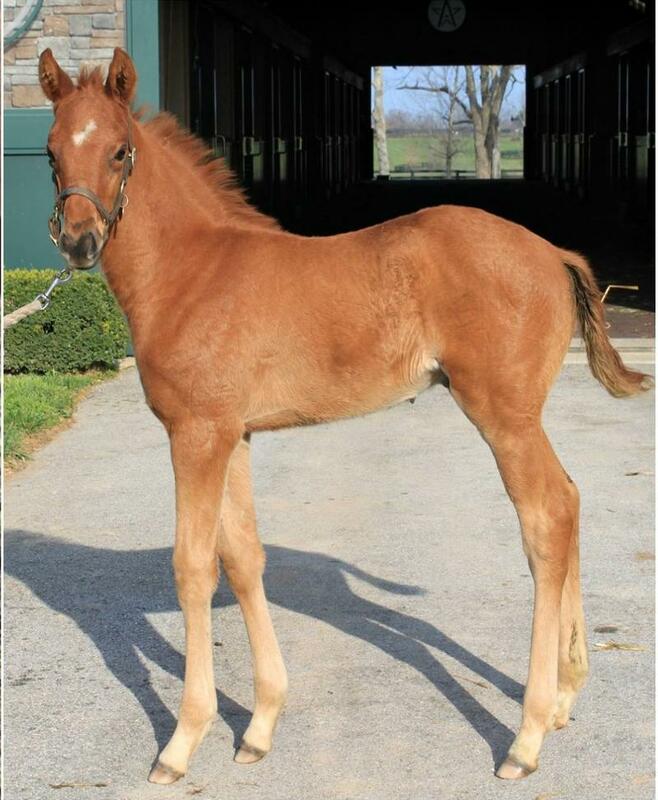 Gun Runner was a pretty good foal with a little bit of fire to him, according to WinStar’s Donnie Preston. Baker detailed what made Gun Runner a good baby. “Gun Runner was an exceptional first foal for Quiet Giant, especially considering his sire (Candy Ride) does not always throw scopey offspring,” Baker recalled. “He was exceptional in his length of leg and frame as well as his athleticism and class. In late 2013, Baker moved to Three Chimneys Farm, where he holds the position of chief operating officer. Gun Runner later came into the Three Chimneys fold himself, following a larger partnership deal involving the Besilu bloodstock. After learning his early lessons, Gun Runner was entered in the OBS Spring Sale of 2-year-olds in training. He took part in the under tack show, covering one furlong in :10 2/5. But he never made it to the auction ring. Instead, Winchell Thoroughbreds bought into Gun Runner privately, and the partnership with Three Chimneys and Besilu was born. Baker remains the longstanding presence in Gun Runner’s tale, and Derby success would add a glorious chapter to the story of the Evans bloodstock. “Candy Ride bred to Quiet Giant is a classic cross of speed on stamina,” Baker explained. Photos courtesy of WinStar Farm via Facebook.